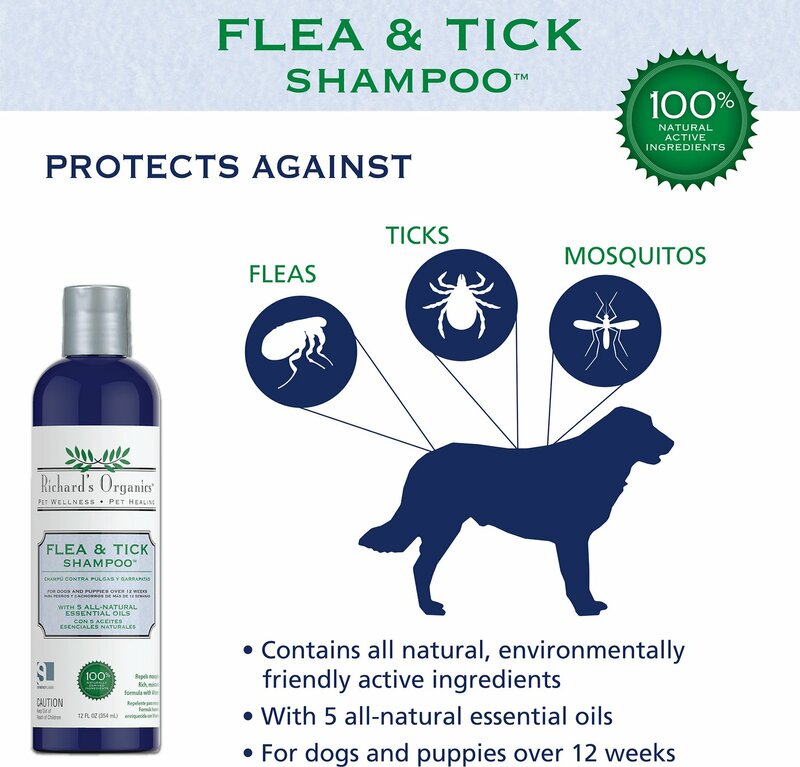 Richard's Organics Flea & Tick Shampoo is formulated to kill fleas and ticks while repelling mosquitos. A natural treatment that is sulfate and paraben free you can treat your pup without exposing you or your furry family to harsh chemicals. Safe to use around children and pets, keep your family itch and worry free! Includes five all-natural essential oils; no parabens added. Active Ingredients: Peppermint Oil, Eugenol (Clove Oil), Cedarwood oil, Cinnamon Oil, Rosemary Oil, Sodium Lauryl Sulfate. Inactive Ingredients: Purified Water, Hydroxy Propyl Methyl Cellulose, Glycerin, Sodium Benzoate, Vitamin E.
Read the entire label before each use. Use only in accordance with label instructions. Wet dog's coat thoroughly. Dispense shampoo into your hand. Starting at the head and working back, work the lather thoroughly into coat and down to the skin. For maximum efficacy, allow lather to remain on pet for a few minutes, then rinse thoroughly and towel dry. Richard's Organics flea and tick solutions are formulated to effectively kill and repel fleas and ticks from your pet and your home. And since they're made with natural ingredients, you don't have to expose your pet and family to harsh chemicals. Instead of harmful chemicals, these flea and tick solutions are made with natural ingredients that you can feel confident using on your pet and around the home. With active ingredients like peppermint oil, clove oil, cedar oil, cinnamon oil and rosemary oil, they're naturally effective solutions. Richard's Organics offers three solutions so you can rid your pet and home of fleas and ticks. And keep them away. Wash your pet with this gentle shampoo to freshen her fur and kill fleas and ticks instantly, while vitamin E and aloe vera provide bite relief. When your pet requires protection but isn't in need of a bath, this powerful solution kills and repels fleas, ticks and even mosquitos. Made from pure boric acid, this powder formula kills fleas at the larvae stage, lasting up to a year. For use on all fabrics and household surfaces. Combining pet wellness and pet healing, Richard's Organics products are natural solutions for better health. Gentle and effective, these products contain all-natural ingredients and are proudly made in the United States. Works great, but takes time getting rid of ticks. About to two bathes with this product will get rid of em. I bought two! They tend to die or just fall off. I wanted to use something without harsh chemicals on my dogs. The smell is great, cleans them up really good, leaves their fur soft and conditioned. I recommend this to any dog lover. I like but pups hated!! So...I loved the smell of this product (smells like Christmas in a bottle!) HOWEVER both my dogs HATED the smell. I did not even put it on their face, only on body, legs and neck and they were fake sneezing all crazy like! It does have a very strong smell and it takes a lot to get a good lather but aside from that, my parti pups had a balck/white coat again instead of black/beige! So I'm not sure I'll buy again since I can get the same results from something that doesn't bother my pups as much. I bought this for it's organic qualities and due to a friend's recommendation ( she's a dog rescue foster mom). Since it's winter here, I cannot attest to the flea and tick properties, but my friend highly recommends this product for that. I liked the licorace fragrance and the dogs coats were shiny and soft. I will continue to use this product. I got this shampoo as an add-on, just in case because I get paranoid when it comes to my puppy. We went on vacation and stayed with someone who had fleas. When we got home we immeadiatelt washed her with this shampoo, as you could see the fleas on her poor belly. She’s on preventatives as well, but she was obviously uncomfortable. You could literally see the fleas falling off of her, it was crazy. The smell is strong but not overwhelming and it made her fur super soft. I love that it’s all natural, so I don’t have to worry about her ingesting harsh chemicals. Definitely recommend this product!! It works. I used it on my one year old dog once and it got rid of the fleas. She only had one, but the flea had laid eggs. So this got the job done. I also bought a flea collar. I would definitely recommend! One bath definitely got rid of fleas & leaves the coat & my dogs feeling great!! Smells amazing. Makes my dogs smell good for days, soft and shiny coats for even longer, then normal dog shampoo. Best Naturalist Hippy Pup Shampoo Ever!! Ive been using this for a while and I love it. I'm a naturalist type of person. I found this when I was looking for a flea shampoo that didn't have strong chemicals nor that nasty chemical smell. My two Jackchis were less than a year old and had gotten into some fleas. Killing fleas is tough, especially with two dogs. This shampoo really helped me with my situation. I mixed a little lavender in it to help with relaxation too :) I used it frequently until the flea issue was nixed and now I only use it when they're stinky, maybe once every other month. they've not had any other flea issues since then, two years ago. No chemicals. Kills adult fleas. Smells good. Natural. Good stuff. Use this for all my pets and my mom's. They had all been covered in fleas for years... couldn't get rid of them! Prescription flea and tick medicine never kept the fleas away... Pets were always sick and cats were sensitive/allergic to different flea meds we tried. 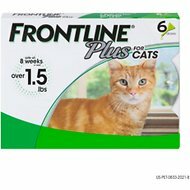 Tried this stuff ONE TIME only took a few weeks before we didn't see ANY fleas anymore. If you want something that works... This is it! So happy to have an organic flea & tick shampoo. At first the smell was a bit strong, but over the days it wore off into a fresh soft pine scent. I receive compliments from strangers on how clean my doggies are. I was even stopped in the street by a lady asking me what dog shampoo I used because they look so clean! This is a winner for me. I also think it will be nice for holiday time since, as someone mentioned in another review, it is reminiscent of Christmas scents. As for flea & ticks... I can't comment because I never saw any which is great since I don't use pesticides/flea prevention.